2016 Funko Moana Mystery Minis reflect the bigger Pop! vinyl figures for the movie while also adding a few more characters from Moana to collect. Disney's newest princess, Moana, is joined by her hero Maui—who also happens to be a demigod—on a quest to save her village from total destruction. During their journey, Moana and Maui encounter several enemies as well as allies. 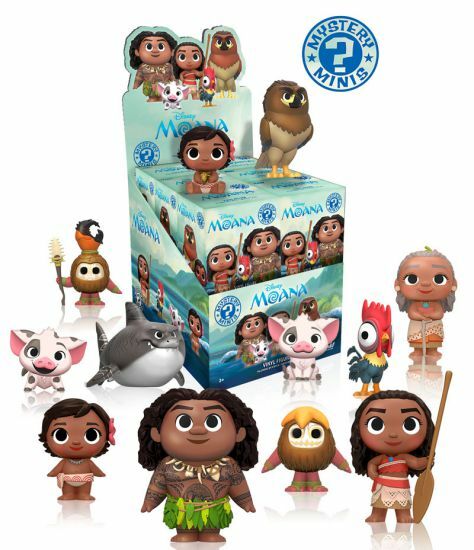 2016 Funko Moana Mystery Minis offer such characters as Moana's pet pig, Pua, along with Hei Hei, the not-too-bright rooster, and her Gramma Tala. Collectors can also find a figure for the eagle form that Maui can assume as part of his powers. In terms of the enemies, the set features two of the crazy coconut-armored Kakamora. Additionally, a shark is also included. It is unclear if the shark is a friend or foe, but one would assume the shark unfriendly. 2016 Funko Moana Mystery Minis follow the traditional mystery formula. Each figure is issued in a blind-box format, keeping the contents of the box unknown until opened. With just 12 Moana characters listed, collectors appear to have a greater chance to complete the full set more easily than most Mystery Minis releases. This is mainly due to the fact that there are 12 boxed figures in each case, and no announcement for any exclusives has been released at this time. The specific odds are not currently known for the 2016 Funko Moana Mystery Minis, but we will update as details emerge. Each mystery minis figure stands approximately 2 1/2" tall. Funko Mystery Mini Disney Moana MAUI w HOOK Hot Topic Exclusive Figure Rare!